International pop star Katie Perry has come to the target of Indian social media users due to one of its Instagram posts. Katie shares the picture of Indian goddess Kali Mata on Wednesday, April 19th. With this, he wrote, 'Current Mood', that is, my mood at this time. "Indian users did not like this post from Katie, so their criticism started. On the Instagram, the Hindu community and other users have taken objectionable posts written with the picture. Users say that this picture of Goddess Kali has its own meaning. But do not know what Katie wants to say by connecting it with her 'mood'. Let us tell that Katie Perry married in 2010 with the comedian Russell Brand in accordance with Hindu customs. However, now both are not together. This post by Katie Perry has also made a fierce debate between Indian and foreign users. During this time, abuses are also used on many occasions. Many users have also defended Katie Perry. He wrote that there is no need to take this post so seriously. Katie Perry is an American singer and songwriter. He sang in the church as a child. In 2008, she came to discuss with her single 'I Kissed A Girl'. In his entire singing career, more than 100 million music records have been sold worldwide. 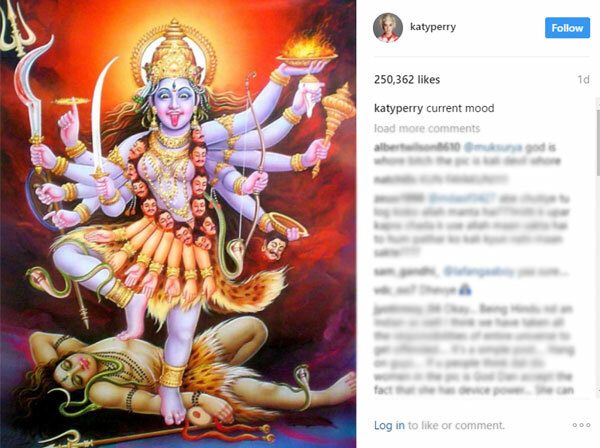 0 Response to "Katie Perry shares photo of mother Kali, flickered Indians"